Whether you’re looking for a wonderful weekend escape or ideas for where family and friends can stay while visiting, you’ve come to the right place. The Piedmont is filled with charming country inns that leave guests feeling refreshed and relaxed. What follows are just a few of our favorites. Why not pick one and make a reservation? And while you’re visiting, do try the restaurants, wineries, and boutiques mentioned in the “While you’re there” section that follows the description of each inn. They’re a few of our favorites, too! Formerly known as Flint Hill Public House, the Blue Door Kitchen & Inn has four gorgeous guest rooms available on its stunning five-acre country estate. All the rooms offer modern amenities such as king-sized beds with luxury linens, free high-speed internet, complimentary tea and coffee, a large shared second-floor lounge, and more. The restaurant has been hailed as a winner by The Washington Post’s food critic. Stay for one night or a whole week; there’s no minimum night requirement, so this is a great place for a midweek or weekend getaway. Located in a renovated 1800s home, Griffin Tavern is pleasing to both the eyes and the tastebuds. Enjoy great home-style food or a pub drink in a casual setting. Narmada Winery offers a wide selection of tasting flights with different flavor profiles to please every guest’s palate. Copper Fox Antiques has everything from architectural salvage to pieces that are vintage, rustic, old, new, and much more. Stop in and explore. A former Civil War Era mansion, this 11 bedroom inn offers the perfect mix of modern amenities and historic charm. Listed on the National Register of Historic Places and completely restored two years ago, this charming bed and breakfast serves as the centerpiece of the Evergreen Country Club. Whether you want to relax by the pool, play tennis, or enjoy a round of golf in the rolling hills of Northern Virginia, the Inn at Evergreen has you covered. For a locally-sourced and organic treat, stop by Hidden Julles Cafe. It offers everything from juices to sandwiches to coffee, making it perfect for breakfast or lunch. With a gorgeous vineyard and tasting room, the Winery at LaGrange is a lovely destination for a day out. Order some of the gourmet snacks available to guests and enjoy with a bottle of one of the winery’s award-winning wines. Details for the Home is two floors of delightful and unique clothing, jewelry, and household items and accessories, and its attentive and helpful staff make it an all-around great shopping experience. Bennett House Bed & Breakfast is located in the historic district of Old Town Manassas and is the perfect place for business travelers, tourists, or locals looking to change things up. A 100-year-old house that’s been a B&B for the past 15 years, Bennett House offers hospitable and antique elegance with modern amenities and a convenient location to all that Old Town Manassas has to offer. It’s within walking distance to restaurants and the Prince William County Courthouse complex, and is within striking distance of the Washington, D.C. area. Everything about Bennett House is unique and inviting, from the country-style breakfasts to the comfortable accommodations. This family-owned restaurant features American dishes infused with Portuguese and Mediterranean influences. The result is an unforgettable fine dining event. Named after the biggest event in the Formula One Italian racing Grand Prix circuit, Monza offers a high-energy and exciting sports bar experience. Did you know olive oil tasting can be as complex and delicious as wine tasting? Experience it for yourself at Manassas Olive Oil Company where you can simply do a tasting, or even take a painting class while you sample the store’s incredible selection. The Rooms Up There offers guests three luxurious king-size suites with a private entrance, foyer, courtyard, and commons. Two of the suites are located above the original stone storehouse built on the property in 1800, while the third occupies the second floor of an addition built in the 1820s. Each suite includes a marble bathroom with handcrafted Italian faucetry, and guests receive complimentary breakfast at the famous Red Truck Bakery just steps away on Main Street. Named one of the D.C. area’s best restaurants by The Washington Post, this charming upscale eatery serves Southern-inspired fare and fine wine in a rustic-chic setting. Pop in for a drink at the bar, or reserve a spot overlooking the kitchen and watch the magic happen. Barrel Oak Winery is a dog-friendly winery started by real people with a real passion for real Virginia wine. There’s always something going on — live music, kids’ activities, and more — so check it out. Discover a treasure trove of antiques and collectibles, gifts and home furnishings at this terrific little shop just a stone’s throw from The Rooms Up There. Chilton House is an intimate, upscale four-room Bed & Breakfast on an acre of gardens and groves just two blocks from Main Street. Enjoy an authentic small-town experience in a beautiful 200-year-old home that tells the story of Warrenton’s past. The house includes eight fireplaces, private baths, and easy access to breweries, restaurants, and shops. Claire’s at the Depot offers locally-sourced and seasonally-focused Southern-style food in what was once a train station. If the weather is right, reserve a spot on the patio for a truly romantic time. In the spring, summer, and fall, grab a seat on the deck for a beer, glass of wine, or one of the Bistro’s creative cocktails. In the winter, head downstairs for a seat near the fireplace or at the bar. Sherrie’s Stuff sells everything from vintage and fair trade goods to handmade, hand-painted accessories and gifts. Sherrie is usually there, so say hello when you stop in! Located steps away from the University of Virginia’s campus, The Oakhurst Inn is the perfect place to go while exploring the city. From there, take the trolley to the Downtown Mall for shopping and dining, see a sports event at the Scott Stadium, or even grab a bite at the inn’s own gourmet cafe — the choices are abundant. By combining modern amenities with the historic character of the area, Oakhurst creates a truly memorable experience for its guests, and a reasonably priced one at that. Drawing from Europe’s best traditions of beer culture, Brasserie Saison uses primarily Belgian and Dutch food on their beer and food menu, although their menu is nothing if not diverse. Add to that a choice wine and cocktail selection, and what comes out is a perfect expatriate European experience. The Champion Brewing Company’s mission parallels their name: to create the best beer possible. Their personal facilities create both consistent and limited edition beers to keep their menu new and exciting every visit, so be sure to stop by for a drink soon! Roxie Daisy was founded by Karen Myers with one goal in mind: creating spaces that reflect the rustic but elegant charm of a countryside home, and the clothing and design items inside match this goal perfectly. Located deep Virginia’s wine country, the Forbes Travel Guide four-star Inn at Willow Grove is a hit among tourists due to its gorgeous colonial plantation architecture and aesthetic. Activities include a spa and gym at the Mill House Spa, an award-winning Vintage Restaurant, and a generous selection of wines from the local area. The grounds of the inn are meticulously tended to, allowing guests to roam and relax as they please. Foti’s Restaurant is nestled comfortably in the heart of Culpeper, and specializes in farm-to-table Mediterranean and New American food. Come in for lunch or dinner and enjoy the relaxed atmosphere while you do! This winery, restaurant, and inn is located in the Southwest mountains of the Virginia Piedmont region. Open for business every day, Barboursville vineyards offers tours and wine tastings for visitors. Make sure to leave some time in your trip for a tour; the Octagon Barrel Room where their famed Octagon wine is made is not a sight to be missed. Deriving their name from the leader of a camel train, this trading store’s original stock ws comprised of selections of aboriginal art and handcrafted items from Central Australia, but now includes products from over 80 different countries from around the world. 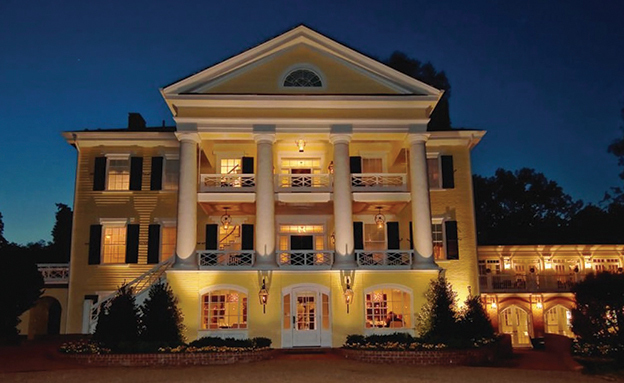 The Goodstone Inn prides itself on its award-winning French restaurant and its location in Virginia’s wine and hunt country, with six historic guest houses designed in English and French country décor. Besides that, there are 18 guest rooms and suites available on the expansive 265-acre estate, ensuring that there is plenty of space available. Guests are able to enjoy the comfort of their rooms or set out and explore to see the breathtaking views of the nearby Blue Ridge Mountains and surrounding countryside. Dedicated to sourcing its menu from the Virginia’s Piedmont region, the Red Fox Inn and Restaurant combines cooking techniques with appropriate seasonality of ingredients, and pairs that with a large selection of local beverages from all over Virginia. If you’re looking for a romantic atmosphere for your dinner, this is the place to go. Greenhill is a must-visit location in Loudon because of its leading wine as well as its charming location. Guests are invited to stay for a winery tour and wine tasting. The Fun Shop prides itself on providing unique gifts of excellent quality at a reasonable price. Items available for sale include Bed and Bath, Kitchen and Gourmet, Children’s Toys, Books and Clothing, and more. The store also includes special ordering and free gift wrapping services, as well as personal shopping service and shipping. Stop by and find the perfect gift for a loved one!